Nobody wins with false alarms – not the police, not your security provider, not the community and certainly not you. Researchers from Temple University estimate that 10 percent of police calls involve responding to alarms – but between 94 and 99 percent of those alarms turn out to be false. High false alarm rates have prompted many local governments to enforce fines for incidents that needlessly tie up public safety resources. If you have a system that was set up by a trained technician, installation probably isn’t an issue. Professional technicians study for weeks or even months to master the finer points of security system installation. If you do have a self-installed system, however, watch out for false alarm trouble spots – like vents, for instance. Air blowing from the heating and cooling system could be enough to trip a home security system, so make sure to position your motion detector and other sensors away from vents and registers. Also, be careful of positioning hanging objects like planters near your motion detector. Just on general principles, it’s a good idea to go over the manufacturer’s instructions. See if you may have missed a step or misread a diagram. If the instructions list a phone number or online tech support page, by all means reach out. By some estimates, pets are responsible for as many as one-fourth of home security false alarms. Down, boy! Fortunately, many of today’s alarm systems include a technological marvel sure to set tails wagging in any home – the pet-friendly motion detector. These devices can distinguish between your indoor animal companions and an actual intruder based on size. Additional equipment or modifications may be required for dogs weighing more than 80 pounds, so be sure to check with your installer, your security provider or the manufacturer. If false alarms have your companion facing banishment to the doghouse or the cat carrier, minimize the threat with a pet-sensitive motion sensor. Pets or no pets, there’s another vital component of any properly functioning security system: fresh batteries. Be sure that your system gets new batteries on the recommended schedule. It will reduce the chance of false alarms and help ensure your system is ready to respond when trouble strikes. The leading cause of false alarms is human error. Since you yourself are only human, how do you address this issue? The answer lies in making sure that you and everyone in your household knows how to operate the system. While you’re at it, add frequent visitors and guests to the Security System 101 list – babysitters, relatives, contractors, etc. Also, notify your security provider immediately if you make any changes to your pass codes or list of authorized users. This way, you can help prevent an authorized entry from being mistaken for an intrusion. You have two things working in your favor. One, full-service security companies usually include a how-to demonstration during the installation appointment. Two, security systems have become increasingly user-friendly, with easy-to-understand control consoles. Follow these three principles, as outlined here in the ADTsecurity.com False Alarm Prevention Guide, and you can effectively address the preventable causes behind false alarms. 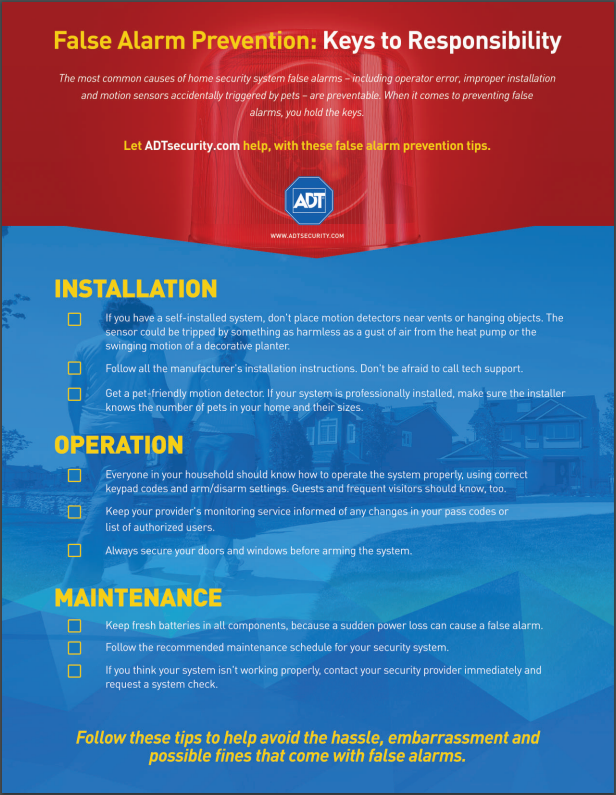 You can also download a master list of prevention guidelines from ADTsecurity.com or watch a video on preventing false alarms from ADT’s YouTube channel. For further information, see the website for FARA, the False Alarm Reduction Association.